The dugout had been quieter. The clubhouse had been more calm. The Laser Show had been put on hold. That all ends today. Seven weeks after the second baseman was placed on the disabled list after fouling a ball off his left foot and breaking it in a game against the Giants, the Red Sox get him back for tonight’s game against the Angels. They get back a former Rookie of the Year, an ex-Most Valuable Player, a past Gold Glove winner, and a key hitter. But more than that, they get back a leader — the face, the voice, and the conscience of the Sox. Without Pedroia the Sox went 23-21 (.523), with him they are 44-31 (.587). There are other factors, of course. The Sox are still without Kevin Youkilis, they just lost Jacoby Ellsbury again, and they might be without both for the rest of the season. But while members of the team talk about Youkilis’s middle-of-the-order bat and Ellsbury’s game-changing speed, they save the truly rhapsodic tones for Pedroia. 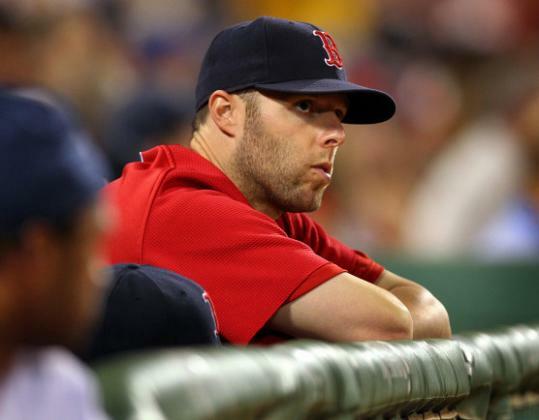 “Just that presence alone gives us confidence,’’ said Bill Hall, who has manned second in Pedroia’s absence. “We’ve missed him over the last few days since he’s been gone, his presence in the dugout. He’s always enthused. He’s injured and can’t play and he’s just as enthused as everybody else that is playing. We’re going to need that, we’re going to need that emotion down the stretch. Of all the Red Sox players to go on the DL — 17 at last count — Pedroia might have had the largest impact, given what he does on and off the field. As manager Terry Francona said last weekend, Pedroia has a unique personality, which is made all the more forceful by what he has done on the field. Kevin Millar used to infuse the clubhouse with his enthusiasm and antics, but he wasn’t an MVP candidate. Pedroia can back up all that talk. And even when Pedroia was on the DL, which often can cut a player off in some ways from the active roster, he didn’t allow that to happen. It’s because he cares so much, because he gives, as Buchholz said, “150 percent every at-bat, every pitch, every play that he makes in the field.’’ That’s why he gets the respect. That’s why everyone in the clubhouse was so disappointed at his injury and why they are all so eager to get him back. They know they are a far better team with him than without him. While Pedroia wasn’t matching his MVP season before he was injured — .292 average, 24 doubles, 12 homers, and 52 runs — his contributions go beyond that. He is one of the best defenders in the league. And then there’s the “fire,’’ as outfielder J.D. Drew put it. The question is whether it’s too late for Pedroia’s return to mean much for the Sox’ playoff chances. With the Yankees and Rays not playing their best baseball recently, the Sox could have made a move. They didn’t. Can they now? It’s clear Pedroia doesn’t need to prove anything. All he needs to do is be back in the lineup and the Sox’ chances improve. “He’s a winner,’’ Hall said. “He goes out and he knows that he’s going to give it everything he’s got every single day, and he expects everybody around him to do the same thing. Just knowing that makes you want to play harder and play better. Having that back is going to be key for us, not to mention he’s an MVP player. That’s obviously going to help in itself. Globe correspondent Dan Hickling contributed to this report.